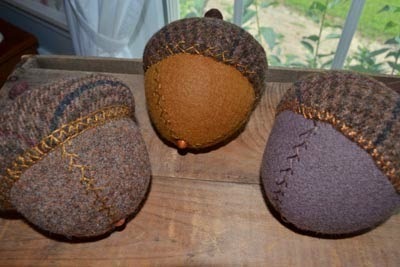 Recently I was asked to create an acorn pincushion. I never make just one of anything, especially if I am creating something I have never made before. I have joking said that my process is about "just cutting and going from there". I don't have to tell you that this is not necessarily the best method. 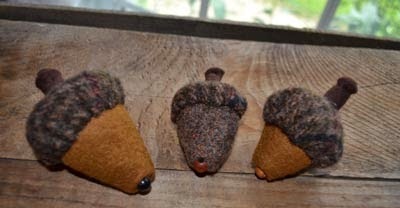 It can create waste, though I don't believe in failing and it takes making at least a few to master the execution of any item, and so I will tell you how my acorn pincushion came to be born. Where to start? I thought about a pineapple pincushion that I had tried to make. That shape would be good, but mine came out to be a lovely pumpkin instead so I also thought about the small strawberry pincushions that I have made, their shape being similar and then I would add a top. I proceeded to cut out several in different sizes. I then thought about my egg ornaments and how they were constructed as well as my other less-round fruit pincushions and decided that enlarging my usual fruit pattern, but using only three sides instead of four and then cutting it in half might give me an acorn nut shape and I would then simply add a circular cap with an attached stem to the top. This too wasn't difficult, though stuffing it's cap and attaching it "straight" on the nut did become an issue, until I turned it upside down to pin it to the nut portion and perfected making it "even" much like I would the hem of a skirt by "measuring up". I must confess this took me back some years for it has been a very long time since I have worn a dress or a skirt! This trial and error process is what is both fun and annoying about creating my own patterns, for in my case I don't know what I have till it is done, unlike my other designer friends that better "plan" and perfect their patterns before executing them. I just "make" it and see what happens. Worst case is that it creates something else and I start over! I also confess that much of my work is less than perfect, especially the first ones. I call such rudimentary beginnings "primitive"! They aren't perfect, but they are "handmade"! When I sewed my own clothes, "handmade" was a derogatory comment and meant "much less than professional". Now in the world of primitive art, stylized versions that are not realistic are sometimes valued more and imperfections announce to the world that they were individually made. I have also come to learn that there is no account for individual tastes. Beauty is in the eyes of the beholder and anything sells at the right price, and my customers let me know right away how to adjust them. If they are priced too highly, they don't sell, or if they sell too quickly I know that I have undervalued my work. 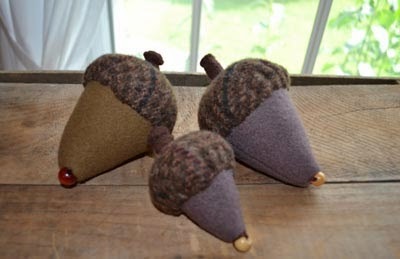 So here are my versions of wool acorn pincushions. 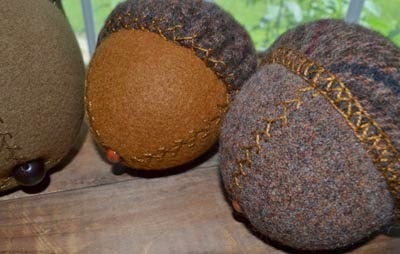 Some are stuffed with ground walnut shell and others polyfil depending on how tightly their wool felted. While offering my customer and friend first choice, I looked up acorns and their symbolism and found lots of information on-line. I included this brief compilation of what I found. There is much more for those of you that are interested. Their symbolic significance was very interesting to read about and I thought added much meaning to the gift for his friend. "About the acorn: Being the seed of the mighty oak tree, which is sacred in many cultures, the acorn symbolizes strength and power and unlimited potential and spiritual growth. They are an emblem of luck, prosperity, youthfulness and power. 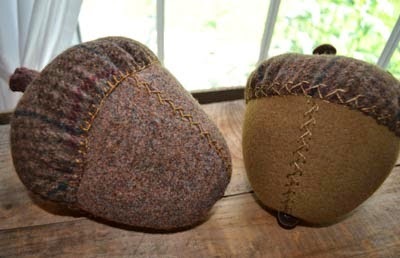 They have been used as a talisman against lightening if kept in a windowsill (though that is NOT a good place to keep wool as wool fades in sunlight). Apparently many window shade blind pulls were thus acorn shaped. Acorns are thought to counteract loneliness, illness, pain and aid in longevity, luck and preserving youthfulness. To plant an acorn by the light of the moon is to bring good luck and prosperity to you. Passing an acorn to someone used to be a way of silently communicating that you were a witch. Soaking acorn caps makes for a natural black dye. Soaking and grinding acorn nuts yield a rich flour for making nutritious cakes that are good for survival. Acorns have medicinal as well as culinary properties. There are great mythological stories about acorns as well. So your gift of an acorn is a symbolically rich gift to be sure."